Saltstraumen is a small strait with the strongest tidal current in the World. It is located in the municipality of Bodø in Nordland county, Norway. It is located about 10 kilometres (6.2 mi) southeast of the town of Bodø. The narrow channel connects the outer Saltfjorden to the large Skjerstadfjorden between the islands of Straumøya and Knaplundsøya. 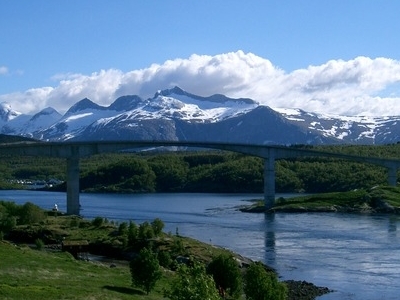 The Saltstraumen Bridge on Norwegian County Road 17 crosses the Saltstraumen. 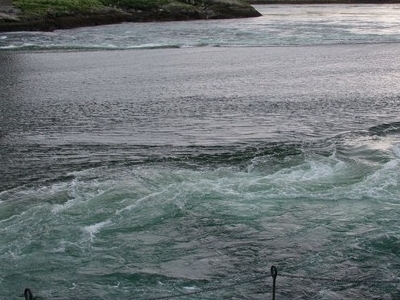 The Saltstraumen is popular with anglers, due to its abundance of fish such as saithe, cod, wolffish, rose fish, and halibut. Coalfish is a specialty of the area. The largest documented coalfish of 22.7 kilograms (50 lb) was caught in the Saltstraumen on a fishing rod. The first element is the name of the district Salten and the last element is the finite form of straum, meaning "stream" or "strong motion of water". Here's the our members favorite photos of "Natural Features near Bodo". Upload your photo of Saltstraumen!